Today marks the 60th anniversary of Fidel Castro’s famous “History Will Absolve Me” speech, given in his defense during his trial following the unsuccessful guerrilla attack on the Moncada barracks on July 26 of that year. The complete speech, which was transcribed after the fact entirely from memory, is available here in English and aquí en Castellano, and below I am highlighting certain extracts which I think are still critically relevant today. To mark this occasion, one source of inspiration has been this year’s publication of Arnold August’s Cuba and Its Neighbours: Democracy in Motion (Zed Books, Fernwood Publishing); chapter 5 (Democracy, Elections and the New State) begins with a few pages devoted to describing and analyzing the significance of the Moncada assault and the “History Will Absolve Me” speech. As Arnold August explains in his important new book, the current debate about democracy, elections, and the nature of the revolutionary state in Cuba, really owes its origins to the period beginning in 1953. The intention behind the Moncada action was to effectively restart the Cuban Wars of Independence of 1868-1898. Fidel Castro gave intellectual credit to José Martí for motivating this attack, but as August notes, he was equally well versed with the works of Lenin and Marx at that time. In the extracts below, one can witness Fidel drawing on an even wider body of thinking concerning “freedom,” which includes key thinkers in the western liberal tradition. Indeed, August acknowledges that there is some debate as to “how radical” Castro’s speech was, with the emerging consensus in Cuba being that it was shaped and suited for the circumstances of the time and was perhaps the most radical statement available in that context. I also see the logic in the latter proposition, if by radical we mean a far-reaching program to solve the most deeply rooted social and political-economic problems and their cultural manifestations. As related by August, Castro commented in 2007 that his 1953 speech contained “the basic elements of a future Socialist revolution, which didn’t have to come immediately–it could be carried out gradually, progressively, but it would be solid and uncontainable…although we wouldn’t hesitate to radicalize it if necessary” (p. 92). In a revolutionary outlook on a struggle that would act as a preview of the hemisphere’s rebellion against dependent modernization over the next 40 years, and against neoliberalism in the 20 years that followed them, Fidel Castro planted a number of cornerstones for a program of radical change. 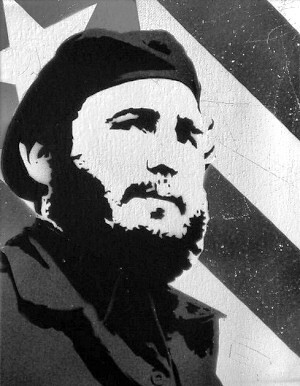 Among these were the notion that sovereignty lies within the people (and here Castro chose “the people” as a category, over “class”); a militant program of agrarian reform to break the monopoly of large estates owned by the very few, that is, the oligarchy; greatly increased rights to increased revenues and even ownership by workers and peasants; and a sweeping transformation of housing, education, and healthcare. These are not accidental choices, nor are they “natural”–they are all key features of any revolutionary leftwing program of social transformation that we find in the Americas and further afield. They speak to a vision of a dignified, good life, free from the avoidable miseries of daily life that are solely the product of the decisions and greed of others. These elements for achieving social justice in concrete terms can be found, beyond Cuba, in the programs of the Sandinista Front for National Liberation in Nicaragua; the Farabundo Martí Front for National Liberation in El Salvador; a range of revolutionary organizations in Guatemala such as the URNG; the New Jewel Movement in Grenada; and closer to the present, the movements and parties embodied by the leadership of Hugo Chávez, Evo Morales, and Rafael Correa, and further away, in Libya under Muammar Gaddafi. Marking this 60th anniversary thus becomes a way of acknowledging original precedents and inspiring ideas that would then emerge and develop in their own terms, in their own contexts, on different soils. Everyone had instructions, first of all, to be humane in the struggle…. ….as to the rest of the national armed forces, would they have fought against a people in revolt? I declare that they would not! A soldier is made of flesh and blood; he thinks, observes, feels. He is susceptible to the opinions, beliefs, sympathies and antipathies of the people. If you ask his opinion, he may tell you he cannot express it; but that does not mean he has no opinion. He is affected by exactly the same problems that affect other citizens – subsistence, rent, the education of his children, their future, etc. Everything of this kind is an inevitable point of contact between him and the people and everything of this kind relates him to the present and future situation of the society in which he lives. It is foolish to imagine that the salary a soldier receives from the State – a modest enough salary at that – should resolve the vital problems imposed on him by his needs, duties and feelings as a member of his community. ….I have a right to express an opinion about the Armed Forces because I defended them when everyone else was silent. And I did this neither as a conspirator, nor from any kind of personal interest – for we then enjoyed full constitutional prerogatives. I was prompted only by humane instincts and civic duty. In those days, the newspaper Alerta was one of the most widely read because of its position on national political matters. In its pages I campaigned against the forced labor to which the soldiers were subjected on the private estates of high civil personages and military officers. On March 3rd, 1952 I supplied the Courts with data, photographs, films and other proof denouncing this state of affairs. I also pointed out in those articles that it was elementary decency to increase army salaries. I should like to know who else raised his voice on that occasion to protest against all this injustice done to the soldiers. Certainly not Batista and company, living well-protected on their luxurious estates, surrounded by all kinds of security measures, while I ran a thousand risks with neither bodyguards nor arms. ….I want to be just above all else, so I can’t blame all the soldiers for the shameful crimes that stain a few evil and treacherous Army men. But every honorable and upstanding soldier who loves his career and his uniform is dutybound to demand and to fight for the cleansing of this guilt, to avenge this betrayal and to see the guilty punished. Otherwise the soldier’s uniform will forever be a mark of infamy instead of a source of pride. ….This is how peoples fight when they want to win their freedom; they throw stones at airplanes and overturn tanks! Fidel is an inspiration to us all.